Published: July 15, 2015 at 12:03 p.m. Updated: Aug. 7, 2015 at 08:10 p.m. When the Tampa Bay Buccaneers selected Florida State's Jameis Winston with the No. 1 overall pick in the 2015 NFL Draft, Winston became the 21st quarterback to be taken with the top pick in the NFL draft's modern era (since 1967). While football fans eagerly await the progress of Winston's NFL career, we'll take a look at what he has to live up to -- on both ends of the spectrum -- with this ranking of the previous 20 quarterbacks to be selected No. 1 overall in the NFL draft. Russell will be a prominent fixture in any "who was the greatest draft bust in NFL history?" debate for as long as NFL football is played. 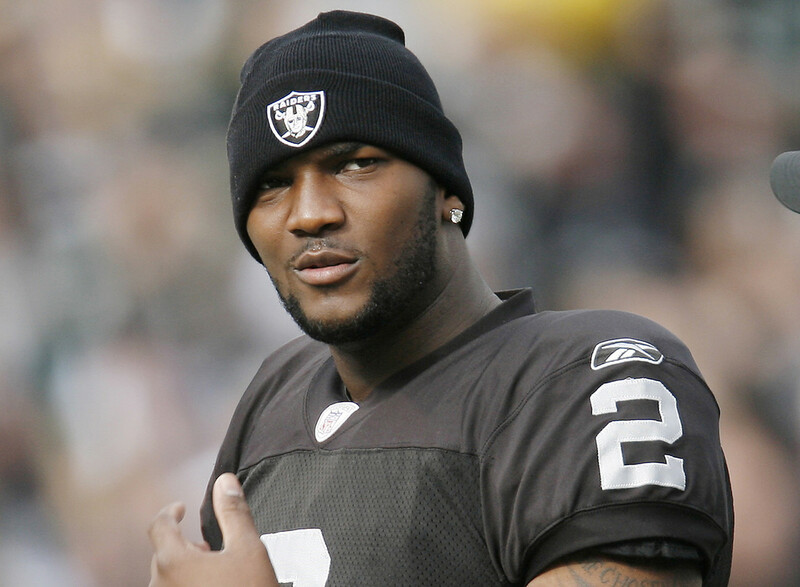 The Raiders passed on a cavalcade of future Pro Bowl players -- Calvin Johnson, Joe Thomas, Adrian Peterson, Patrick Willis, Marshawn Lynch, Jon Beason, Joe Staley, Ryan Kalil, Marshal Yanda, Eric Weddle, just to name a few -- to take Russell, who lasted just three seasons in the NFL. The Browns came off their three-year hiatus with hopes that Couch would be a franchise quarterback to build around. Instead, the Browns have had 22 different starting quarterbacks since then (and likely a 23rd once the 2015 NFL season kicks off). Like Couch before him, Carr was expected to be the cornerstone of a start-up franchise. However, The Texans couldn't keep Carr upright -- he set an NFL record that still stands for times sacked, with 76. He led the league in times sacked three times in his first four seasons (208 times total in 60 games played). After the 2006 season, Carr was released and he spent his final NFL seasons as a backup. After five mostly injury-riddled seasons in St. Louis, Bradford was traded to the Philadelphia Eagles. His NFL career started promising -- he earned NFL Offensive Rookie of the Year honors in 2010, and had a career-high 3,702 yards and 21 touchdowns passing in 2012 -- but knee injuries kept Bradford out of all but seven games the past two seasons. Of the 20 quarterbacks selected No. 1 overall (excluding Winston since he has yet to play in the NFL), only four have failed to record a single playoff appearance. Bradford is one of them. The other four? Not exactly elite company: JaMarcus Russell, David Carr and Tim Couch. George played 12 seasons with five different teams -- though he did spend time with but didn't play for two others, the Seattle Seahawks in 2002 and Chicago Bears in 2004. In 1997, George -- while playing for the Raiders -- led the league in passing yards (3,917), beating notables such as Brett Favre, Dan Marino, Drew Bledsoe, Warren Moon and John Elway. The 49ers will get knocked for eternity for passing on Aaron Rodgers and drafting Smith at No. 1 overall instead in 2005, but he's directed two different teams to the playoffs -- the 2011 49ers and 2013 Chiefs. in 1974, the Falcons' quarterbacks were Bob Lee, Pat Sullivan and Kim McQuilken, the trio combined to throw four touchdowns and 31 interceptions. In all, the Falcons offense scored just 12 touchdowns, the lowest total in franchise history, and the team finished 3-11 on the season. Bartkowski was the top pick and the Falcons paid him handsomely to help fix their offense -- $650,000 over four years, the richest rookie contract at the time. By 1978, the Falcons were in the playoffs, the first of three appearances over the next five years. This might come as a surprise to many, but Testaverde ranks No. 9 all time in career passing yards with 46,233 -- right behind Fran Tarkenton (47,003), who had held the NFL record until fellas such as Dan Marino, Brett Favre, John Elway and Warren Moon came around. That total is a testament to Testaverde's ability to maintain his career. He played 21 seasons in NFL for seven teams. For a period of time, Vick was the most exciting NFL player to watch. He was equally as dangerous chucking the pigskin as he was running with it. In 2006, Vick became the first quarterback to rush for more than 1,000 yards in a season. A few months after that accomplishment, his career came to a crashing halt. A suspension in 2007 derailed his career, Vick rebounded in 2010 to become the NFL Comeback Player of the Year. Stafford helped rescue the Lions from the embarrassment of an 0-16 season in 2008, leading the team to the playoffs just three seasons later. He's twice led the Lions to the postseason, which is important because the Lions did have one of the longest playoff droughts when he arrived, not having reached the postseason since 1999. Statistically, Stafford has piled up impressive yardage totals throwing for 5,038, 4,967, 4,650 and 4,257 yards the previous four seasons. Newton has helped the Panthers make history of sorts, becoming the first NFC South team to win back-to-back division titles (note: the NFC South dates back to 2002). In a sense, Newton has taken over that must-watch role that was vacated by Vick four years before Newton entered the league. Newton isn't the same threat to run (career-high 741 yards rushing in 2012), but is a more dynamic passer (career-high 4,051 yards in his rookie season). Like so many quarterbacks taken No. 1 before him, Bledsoe was expected to be the cornerstone of a rebuilding project for a franchise that had sunk to the depths of the NFL standings. Coming off a 2-14 season, the Patriots hired a new coach -- Bill Parcells -- and with the top pick took Bledsoe. In two years, the Patriots were in the playoffs for the first time since 1986 after Bledsoe led the NFL with 4,555 yards passing. Two years after that, Bledsoe had the Patriots in the Super Bowl. So far, Palmer has had the most successful NFL career for any Heisman Trophy-winning quarterback over the past quarter century. After helping drag the Bengals out of the depths of mediocrity in the mid-2000s, Palmer is now a vital cog in the Cardinals' hopes to make back-to-back postseason appearances. This is a conversative place for Luck, who has a chance to violently vault up these type of lists very quickly. Luck has taken the Colts to the postseason in each of his three NFL seasons. Last season, Luck led the league with 40 touchdown passes. Luck has the potential to be at or near the top of this list once his career is complete. Plunkett had a bit of a vagabond existence in the before finding a comfortable home with the Raiders, a team then-known as being a refuge for NFL misfits. Plunkett is the only non-active two-time Super Bowl-winning quarterback not in the Pro Football Hall of Fame. He was named game MVP in the Oakland Raiders' win over the Philadelphia Eagles in Super Bowl XV, and was a vital part of the Raiders' upset of the Washington Redskins in Super Bowl XVIII. Like Plunkett before him, Manning is a two-time Super Bowl winner. And, like Plunkett, Manning's two Super Bowl wins will make him an interesting case study once it is time for Pro Football Hall of Fame consideration. Manning was game MVP in both of his Super Bowl wins, including a shocking upset win over the then-unbeaten New England Patriots in Super Bowl XLII. Aikman directed the "Team of the '90s", leading the Cowboys to three Super Bowl triumphs -- including one game in which he was MVP -- and for a six-year run from 1991-1996 was an annual Pro Bowl selection. With 90 wins as a starter during the 1990s, Aikman became the winningest starting quarterback of any decade in NFL history. Bradshaw was provided a great luxury that quarterbacks in today's game don't experience. It took Bradshaw several seasons to grasp the NFL game. The statistics from his first five seasons are brutal -- 48 touchdowns to 81 interceptions; only once with a completion percentage over 50 percent. However, Steelers coach Chuck Noll showed patience, and that patience paid off handsomely in the long run. Bradshaw and the Steelers experienced unprecedented success, winning four Super Bowls in a six-year span; Bradshaw was named MVP in two of those Super Bowl wins. Manning already holds the NFL's career touchdown passing record (530), and should break the career passing yardage record this season (he's at 69,691 yards to Brett Favre's 71,838 yards). Manning already holds the records for most passing yards (5,477) and touchdowns (55) in a single season. While Manning has achieved statistical glory, victory in the NFL's ultimate game has been elusive. While he's taken his team to 14 postseason berths, Manning has just one Super Bowl win (Super Bowl XLI) in three appearances. Elway was originally selected by the Colts, but he refused to join the team and was ultimately dealt to the Denver Broncos, for whom he flourished. Elway came of age with "The Drive," which led to the first of five Super Bowl appearances delivered by Elway. He finally won the big one following the 1997 season. He then led the Broncos on a Super Bowl triumph repeat the following season.